Remember the 1980s? Who could forget the decade of big hair, extravagant fashion, great music and groundbreaking technical achievements – brick-sized cell phones, monochromatic PC screens, first Mac computers and squarish car design. Tacky and hilarious from today’s perspective, but I always say that I was born a decade too late. Facing severe losses, BMW abandoned the large luxury saloon market in the 1950s; Mercedes-Benz was too large and too powerful to compete with. Instead, the company has created something truly revolutionary – a range of smaller sedans with traditional BMW luxury and performance characteristics. The so-called “New Class” line up was an instant success around the world and had helped BMW to establish its trademark sports-luxury image, the theme present in its cars up to these days. Growing rapidly during the 60s and 70s, small bavarian sedans were already established as a serious threat to Mercedes-Benz, mostly because Merc was all about comfort and luxury, while BMW has added performance and fun handling to the prestige market, something that was unusual at the time. The oil crisis was over and the economy grew rapidly, backed up by the new industry branches (digital revolution and the boom in Silicon Valley). The socio-economic welfare was felt in the habits of buyers – the market for everything prestige was flourishing. Suddenly, everything that was considered luxurious before became outdated and unattractive – this demand for new luxury was created by a new class of people called young urban professionals, better known as yuppies. The second generation BMW 3 Series (codenamed E30) was introduced in 1982. Every panel on the car was new while the already advanced suspension set-up was heavily modified. The overall shape hasn’t changed much, but the new car was more streamlined and aerodynamic than the previous one. Interior space was still tight, but knowing that Mercedes will soon release its first small saloon, BMW engineers have spent a lot of time configuring the cockpit layout. It was also one of the first cars in the industry to feature a electronic monitoring device and service warning lights. The design and the materials used are even now considered ahead of its time, specially when you compare it with the interior from the manufacturer who today claims that it makes the best interiors in the industry. Of course, a BMW is not complete without an outstanding engine and this is were the smallest Bimmer was also setting standards. From the entry-level 316i to the most powerful 325is, all engines were a BMW typical mix of performance and economy. And we cannot forget the iconic M3, which was first presented in the E30 generation, but that particular model reserves a special article, if not a book. The E30 3 Series was also offered with a all-wheel drive (dubbed 325ix) and with a straight six diesel engine in 324d and 324td version. As mentioned before, yuppies were the new luxury buyers: young executives, college graduates, “rich kids” with well payed jobs and/or rich parents. Their busy lifestyle and the need to be independent, to live an affluent lifestyle but still go out, have fun – generally to be young but still be a professional has affected their purchasing needs and wants: European designer clothes, Walkmans, expensive restaurants and night clubs, cell phones and of course, european sports cars (or one car in particular). 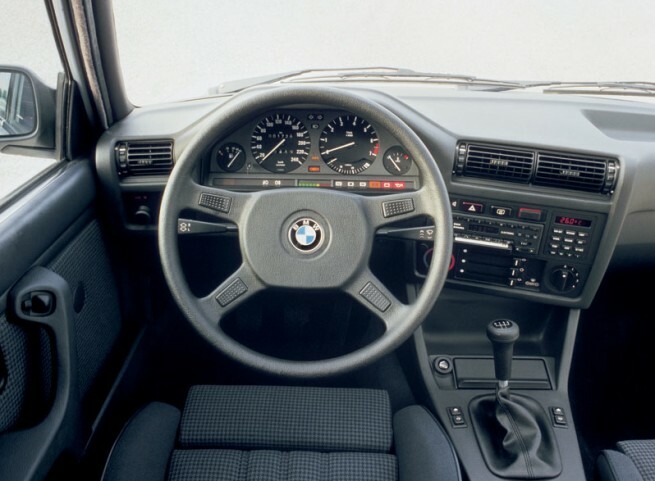 Shortly after its introduction to the market, the E30 3 Series became an instant hit with the buyers, specially with old BMW drivers who appreciated its trademark performance and new, more luxurious personality. But the 3 Series was also warmly received by the “new luxury” buyers, to that point that the car is still today used as a symbol of the yuppie culture. And it’s easy to see why: BMWs slightly aggressive image and the 3 Series’ prestige but sporty appeal was the complete opposite to Merc’s more conservative image at the time – the right mix to go with the yuppie attitude of time. The car was also backed up by starring in numerous popular movies and TV shows of the time: Beverly Hills Cop, Miami Vice, Pretty in Pink, Bird on a Wire, Beverly Hills 90210, Seinfeld, to name a few. In short, if you were in your late 20s or mid 30s and you were earning a lot of money, you couldn’t be seen without an Armani suit or a Ralph Lauren polo shirt, Ray-Ban Wayfarer sunglasses, Sony Walkman, squash racquet and a BMW 3 Series or if you were more lucky, a Ferarri Testarossa parked outside the trendiest night club in town or your downtown apartment – and without any “Baby on board” signs – how can you support kids while you’re still young? 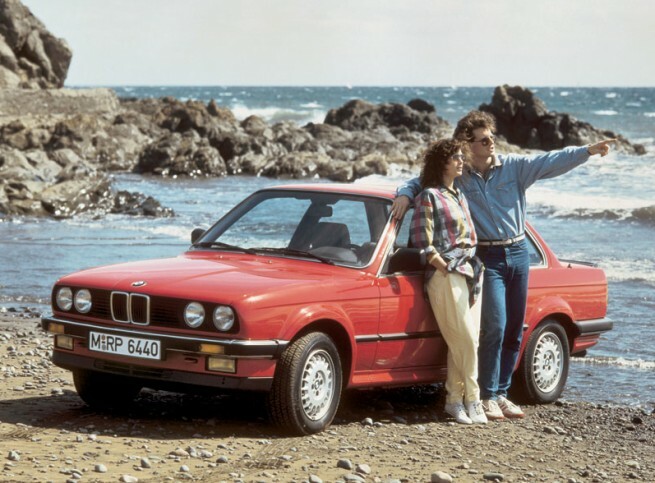 In 1988, the 3 Series sedan has already marked its one millionth example, just to be enhanced with the convertible version that has made the car even more popular. The production of the two most popular models, 2-door coupe and 4-door sedan has stopped with the release of 1991 E36 3 Series, but the convertible and touring were kept in production until 1993 and 1994 respectively. The E36 line was an enormous success, easily beating the Mercedes 190E and some new rivals, like Audi 80 or entirely new brands, such as Lexus and Infiniti. While the new 3 Series was a giant leap forward, featuring back then revolutionary Z-axle multi-link suspension and numerous engine and interior improvements, the car’s edgy character and pushy image were replaced with a more sophisticated and secure one. Three generations after the E30, the 3 Series had to lose some of its fizz and excitement for comfort, safety and refinement, but it’s still the most focused, balanced and driver-oriented car in its class and the standard upon its competitors are measured. Always a symbol of young and aspiring, the 3 Series is now in its middle age, waiting for its next generation, due in 2012. The prototypes are still wrapped in psychedelic cover, but the lower bonnet, even shorter overhang and slimmer profile show a departure from “bigger is better” philosophy. And if my memory is good, the M Division boss said that we should expect “E30 level of madness” in the new M3. So while I still wish I could have lived in the 80s, suddenly the future doesn’t seem so bad at all.